Another simple recipe that I want to share. I love the feeling of knowing exactly what's in the foods that I eat/cook with. This was super easy to make. The sourness with a little kick of spiciness was PERFECT! 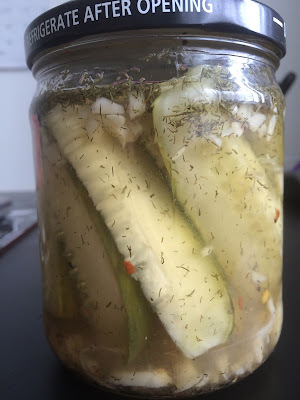 Wash the cucumber, cut the ends off, and cut into spears; add the spices and vinegar to the jar; pack the cucumbers into the jar; add water and seal tightly storing at room temperature for 24 hours before storing in the refrigerator. *For best results make sure the cucumbers are ripe and not limp. I said I was going to save and not touch it for a recipe, Ha!…. one bite next thing you know there's no more. I was snacking like it was nobody's business. So back to making this again. It was so good. -Don't limit yourself to just cucumbers there are others out there waiting to be pickled like green beans, bell peppers, and more. -Check out my Haitian Pikliz recipe, it's a Haitian pickled version of the American coleslaw. Stay away from certain brands of store bought pickles that is loaded with crappy ingredients with artificial coloring. I used to buy them and could tell the difference and it's why I prefer to make my own.